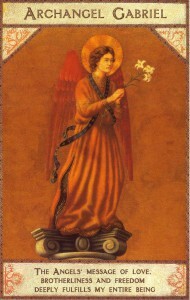 Symbolism: Gabriel is depicted holding a lily, which stands for a purity and truth. He is sometimes seen with an ink-well and quill, symbolizing his function as the heavenly communicator of the Word of God. He can also be seen holding a golden chalice strongly reminiscent of the Grail. Traditionally Gabriel is the messenger of the Word of God. His name means’God is my Strength’. He announces the mystery of incarnation to all souls before they are born and he instructs us all as to what our talents and tasks in this world will be. He is the patron saint of small children and he looks after and nourishes the child in each of us, a child who may be arrested in growth or wounded and in need of love. He guides us to release our inner child with words of tenderness and love. His guiding hand is always there to protect what is natural and pure within us. All religious honour Gabriel as the most powerful messenger of the Source.he never tires of delivering the Word of God to those who will listen and honour the Source within themselves. He is known as the Chief Ambassador to Humanity, the Angel of Revelation, the Bringer of Good News, Judgement and Mercy. He is the Angel of Joy, and the Spirit of Truth. Gabriel helps us to find the wisdom in our physical bodies and to know our personal truths. He respects the absolute individuality of each person. He can assist us to live our truths faithfully, honouring our talents and gifts. He can help us find the courage to live from the deep knowledge within ourselves which respects our God- given abilities. Gabriel can also help us succeed in developing our individual gifts and fully expressing ourselves. Gabriel’s quintessential gift to us is to nurture our strength and our conviction that we are each making a valuable contribution to the spiritual development of humanity simply by being who we are. He is available to help us ascertain the truth in situations where there is conflict between what we know to be right and what is being represented as truth. He helps us to see what is real for us in every situation where our insight and intuition are called upon to direct and guide us. Gabriel lights the way to the truth within our hearts, and helps us to see what is the right path for us to follow for our highest good and greatest joy.